What is an Integrated Management system? The management system developed is then referred to as an Integrated management system, also referred to as IMS. In very simple terms, an IMS integrates all the systems and processes of each pilar within an organisation into one single unified management system. IMS is one complete framework that enables all the pillars within an organisation to work as a single system with unified objectives and targets. Each function is behind a single goal; to continuously improve the organisations performance. There are many advantages towards implementing an IMS. First and foremost is that the organisation can address their objectives and targets, non conformances and management review meetings at once instead of having multiple meetings for each pillar management system. Secondly, an IMS reduces overhead for only a core team of members will be needed to sustain the system compared to having numerous pillar managers and subordinates. Thirdly, an IMS can be tailored to any organisation regardless of size, complexity or industry. An IMS allows your management team to create one system that can help to effectively and efficiently deliver your organisations objectives. Consider an IMS to manage the pillars within your organisation so all pillars are given the necessary focus to be successful and everyone will benefit from the rewards. Why should an organisation develop and implement an Integrated Management systems? 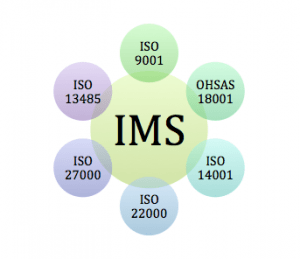 Quality, Environmental, and Safety management systems are often combined and managed as an IMS. These systems are not separate systems that are later joined together, rather they are integrated with linkages so that similar processes are seamlessly managed and executed without duplication. When an organisations needs to have in place multiple management systems, it multiplies the effort needed to maintain multiple systems. When Integrated management system is implemented it streamlines requirements from the multiple systems and simplifies Implementation of system and later maintenance of the management systems.